Geraldine rally driver Hayden Paddon has again been promoted to one of Hyundai's WRC cars for the Wales Rally GB next month. Hyundai Motorsport has changed its driver line-up for the season finale as it fights for second place in the 2015 WRC Manufacturers' Championship. Paddon will partner Dani Sordo in the Hyundai Shell World Rally Team for the GB rally, with the Belgian Thierry Neuville dropping down to Paddon's car. In a statement, Hyundai said the move was to also to help Neuville regain his confidence ahead of 2016. 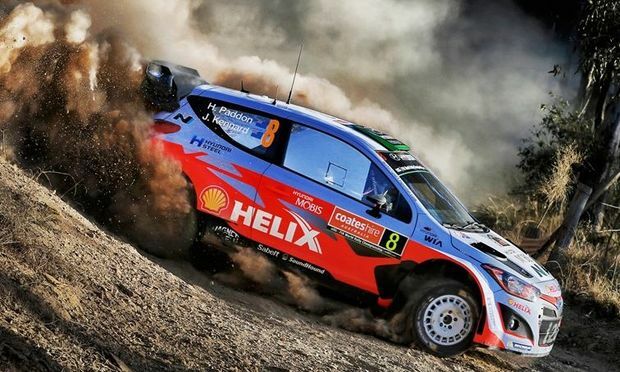 The decision was taken and fully supported by all parties following a meeting at the team's factory on Monday between Neuville, his co-driver Nicolas Gilsoul, Neuville's manager and Hyundai Motorsport team management. Hyundai Motorsport reaffirms its full confidence in Neuville, who was already confirmed to drive for the team in 2016, and hoped that the decision would help the Belgian rebuild his confidence and proven capabilities in the Hyundai i20 WRC, without the added pressure of a Championship battle. There will be no driver changes for next week's Rally de España, with Paddon in his regular second tier car. Paddon also got a drive in one of Hyundai's top cars in last month's Rally Australia. Paddon is currently eighth in the driver standings, Neuville fifth and Sordo 10th. Hyundai is third in the manufacturers standings, just a point behind Citroen. Volkswagen has already won the title.